The term “uberization” is derived from the company Uber – the taxi company which introduced this business model. Uber is a transport service which you avail by booking a ride from your smartphone whenever and wherever you need it. Uberization is a business model where supplier and customer communicate directly via mobile technology, website or software and agree upon the services offered by a supplier, customer requirements, and payment terms and conditions. Technology has changed the labor world a lot. Now you don’t need to go to the market in search of a service or a product. Many services and products are easily accessible on your laptops and mobile phones. While sitting cozy on your couch, you can now hire a freelancer for your new project. A third of Americans provide freelance services and, incidentally, there is a huge supply of freelancing service. The idea of Uber is favorable for both the client and workers. The small business economy can especially drive growth by uberizing. Use of digital platforms for peer to peer transactions. Decrease the distance between customer and service provider. Assessment of the quality of the product or service by using a rating system. eBay, TaskRabbit, Uber, Airbnb are a few examples of growing uberizing. Here are a few examples of how uberizing can be beneficial for small businesses. Online navigation tracking is utilized to find out the potential customers searching for a specific product. The online retailers monitor these customers and provide them complementary products or services along with cost comparisons. The websites have a detailed description of the product, it’s availability, customer satisfaction, expected delivery date, and tracking details of the order. A survey shows that during Christmas, 50% of the customers buy a different product than the one they intended to purchase. The reason behind this was online searching for that product by those 50% customers. Online retailers attracted and diverted those customers to buy their products by providing them details within minutes. Buying a product online has a number of advantages. Customers have more choices and the freedom to compare various brands at a time, with no pressure from a retailer to buy their product. Customers compare products and hold off on ordering until satisfied. Online purchasing or uberization is now one of the preferred services availed by customers. The ease of purchase and time saved are the critical benefits of uberization which are driving small businesses toward growth. Uberization is growing business because it listens to the heart of the customer. The customer expects that all information regarding products or services should be available. All questions should be answered such as the expected delivery time, location, and refunding charges. Satisfied reviews are the most forceful attention driving services provided to the customers. Customers can control the time, date, and location that the product is to be delivered so they find it more convenient to utilize online services. For small business growth, uberization is time-saving. Building a concrete office, hiring a workforce, and marketing the product is quite a long process. If you develop a virtual online store or service room, all three are done in one go. Time is also saved and ultimate growth is ensured. With time, technology has replaced many things in our daily routines. PC desktops, watches ,cameras, calculators, and stop watches are all things of the past. Due to the evolution of technology during the last few years, all of this information is available on your smartphone. Excessive use of smartphones has forced small business owners to uberize their products and services. According to a survey, an individual checks their smartphone forty-six times a day. 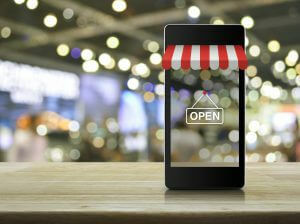 Providing ways to purchase products on a smartphone is a significant step towards the rapid growth of businesses. In the recent advancement of smartphone technology, uberizing a small business economy is the most–wanted step towards the rapid growth of all kinds of businesses.